The Western Derby (/ˈdɜːrbi/) is the name given to the Australian rules football match between the Fremantle Dockers and the West Coast Eagles, who both participate in the Australian Football League (AFL). As both teams are based in Perth, the capital city of Western Australia, the term "derby" is used to describe the match. It has become one of the most important matches for football in Western Australia, with former South Fremantle and West Coast player, and former West Coast coach John Worsfold claiming that in the week before a derby that it is the main topic in Perth. The AFL Record is the official program available at Australian Football League (AFL) matches. The publication began as the Football Record in Melbourne, Australia in 1912, making it one of the oldest magazines in Australia. This page is a complete chronological listing of AFL Women's minor premiers. The AFL Women's (AFLW) is the elite national competition in women's Australian rules football. In Australian rules football, a banner is a large crêpe paper and sticky-tape banner constructed by each team's cheer squad. It is hoisted before the start of a match, and typically shows an encouraging or celebratory message to the team; then, as the players take to the field, they run through the banner, breaking it. Traditionally, the captain, or a milestone-achieving player leads the team when breaking the banner. This page is a complete chronological listing of AFL Women's premiers. The AFL Women's (AFLW) is the elite national competition in women's Australian rules football. The origins of Australian rules football date back to the late 1850s in Melbourne, the capital city of Victoria. The Charles Brownlow Trophy, better known as the Brownlow Medal (and informally as "Charlie"), is awarded to the "best and fairest" player in the Australian Football League (AFL) during the home-and-away season, as determined by votes cast by the officiating field umpires after each game. It is the most prestigious award for individual players in the AFL. It is also widely acknowledged as the highest individual honour in the sport of Australian rules football. 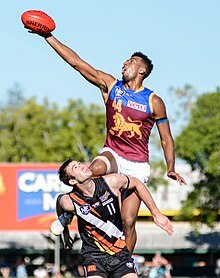 In Australian rules football, if a player takes a mark or is awarded a free kick shortly before the siren sounds to end a quarter, the player is allowed to take the kick after the siren. Often, the result of this kick is of little consequence, but if the player is within range of goal, any score will count towards the final result. The comparision between Australian rules football and Gaelic football is the subject of controversy among historians. The question of whether the two codes of football, from Australia and Ireland respectively, have shared origins arises due to similar styles of play in both games. Lightning football is a shortened variation of Australian rules football, often played at half of the duration of a full match. This list includes the appointment date and performance record of current AFL Women's senior coaches. The league consists of women's teams from eight of the Australian Football League (AFL) clubs, with every state, which has an AFL team, featuring at least one AFL Women's team. In addition to Adelaide having a joint licence with AFL Northern Territory, whereby some of the team's players reside in the Northern Territory. The league is set to expand in 2019 and 2020 with Geelong and North Melbourne entering the league in 2019, and Gold Coast, Richmond, St Kilda and West Coast entering in 2020. ... that Australian rules footballer Will Schofield played on in a match despite a compound dislocation of his finger?